We were very fortunate to have as our guest speaker Prof Mike Edmunds who is part of the Antikythera Mechanism Research Project which is a joint project to investigate a recovered object from a shipwreck off a Greek island. This and many other valuable archaeological pieces were discovered when in October 1900 a team of sponge divers were forced to shelter from a storm by mooring at the island of Antikythera. After the bad weather had abated they began diving for sponges off the island coastline and found a shipwreck roughly 60 metres below the surface. It was on a later archaeological expedition on 17th May 1902 that the archaeologist Valerios Stais found the Mechanism when he spotted a rock with what looked like a gear wheel embedded in it. 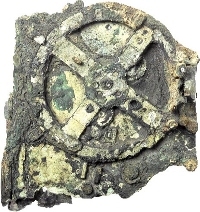 Originally it was thought to be a mechanical clock but later investigations have shown that the device is actually the world´s oldest known analogue computer used to predict astronomical events. By dating the recovered artefacts and carbon-dating some of the hull planking, scientists have concluded that the ship was probably Roman and the cargo may have been loot captured by the Roman General Sulla in 86 BCE. This remarkable device appears to be years before its time, as the level of miniaturization and complexity of its parts rival some 18th Century clocks. It was possibly made in Rhodes which was the centre for bronze-working at that time having been home to one of the Seven Wonders of the World - the Colossus of Rhodes. It is about the size of a shoebox and there are 7 larger fragments and 75 smaller pieces. As it is a priceless artefact any examinations have taken place in situ at the National Archaeological Museum of Athens. Using the latest techniques including sophisticated surface imaging and X-ray tomography the device has finally revealed some of its secrets. Using Babylonian knowledge the Mechanism predicted lunar and solar eclipses, the position of the Sun and Moon and a calendar that allowed for leap years. As well as showing lunar phases it also calculated the timing of the Ancient Olympic Games. It may even have displayed the positions of the planets but unfortunately some the Greek inscriptions are missing to conclusively prove this idea. It was more than likely hand driven in a wooden-framed case with front and rear doors.